With Delhi Capitals snatching victory from the jaws of defeat in their last game of the IPL 2019 against Kolkata Knight Riders, the fans must have thought that the team would once again replicate the act for the match against Kings XI Punjab in Mohali. But alas! This time Shreyas Iyer and men snatched defeat from the jaws of victory as the batsmen failed to deliver for the team as they were chasing a total of 166 runs, which is touted to be quite gettable. All thanks to KXIP bowler who delivered a stellar of a performance. Sam Curran Takes Hat-trick as Delhi Capitals Collapse From 144/3 to 152 to Lose to Kings XI Punjab. After winning the toss, Delhi Capitals elected to bowl. The hosts went on to lose KL Rahul after he played 11 balls scoring 15 runs. Sam Curran also made way to the pavilion when the scoreboard read 36. Mayank Agarwal got run-out on 6. But Sarfaraz Khan, David Miller and Mandeep Singh tried to stabilise the innings by scoring 39, 43 and 29 runs respectively. Titbits from others helped the team reach a total of 166 runs. KXIP beat DC by 14 runs. On the other hand, Delhi Capitals lost Prithvi Shaw in the first ball of the innings. Shikhar Dhawan, Shreyas Iyer, Rishabh Pant and Colin Ingram were the batsmen who made the total look gettable as they stuck around for a while. Poor shot selection and silly judgements cost Delhi Capitals the game. Once DC lost Chris Morris via a runout, the KXIP bowlers dominated the game and ripped apart the batting line-up of the visitors. Sam Curran got a hattrick, Ravi Chandran Ashwin and Mohammed Shami both snapped a couple of wickets each. Five batsmen from Team DC departed for zero and it wouldn’t be wrong to say that Rishabh Pant and Colin Ingram and Shreyas Iyer failed to take up the onus for taking the team to the finishing line. # This is the first time since 2011 that Delhi Capitals got five ducks in one inning. In 2011, five players of the team got out on zero against Mumbai Indians. # Sam Curran becomes the second youngest player to have scalped four wickets in an inning. Curran is 20 years and 302 days old. Mitchell Marsh was the youngest player to have that record against his name. He scalped four wickets against Deccan Chargers (Hyderabad) in 2011 when he was 19 years and 202 days old. # With this, Sam Curran also registered third best figures for KXIP by claiming four wickets conceding 11 runs. # This was Delhi Capitals' worst seven-wicket collapse in the IPL. The team lost seven wickets just wight runs. # Sam Curran became the fourth player for KXIP to get a hattrick. 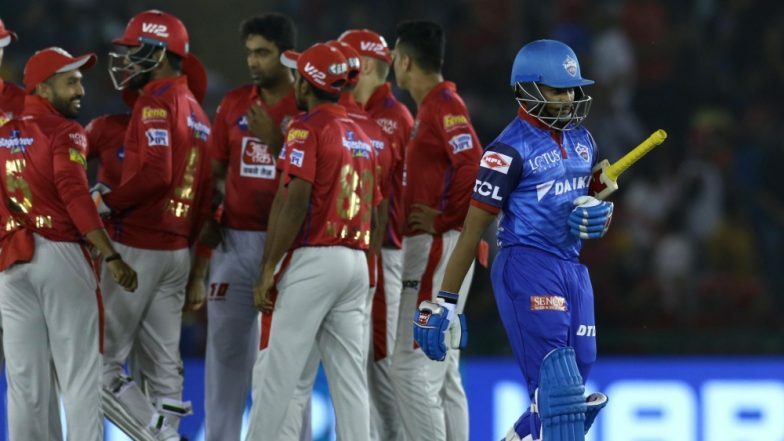 After the match, Shreyas Iyer was at the loss of words for the team’s dismal performance. He even admitted that the team did not play smart cricket and said that they will have to train themselves mentally for these situations.